The combination of the above all point to his single business goal for 2019 (which is to SELL – It is all about sales?) are already adding up to make this a successful year filled with growth for his company. In the first few weeks of the year he has taken action in each area. He is getting active again in his local community by joining and attending networking event. Hired a sales consultant to work with him on his outbound selling strategy. He attended Heather Lutze’s “Findablity University” – an amazing workshop filled with real actions he can take to make him more findable online to prospective customers. Another area that Thom is getting serious about is finding a mentor. Some might think “what? Finding a mentor when over 50? What?”…. But he is confident that he can find a person who will be the right friend at the right time. Discovering this person will not be simple, but in order to grow your business you have to take on tasks that are often difficult and out of your comfort zone. Thom is learning to ask for more referrals. He starts this episode by appealing to the listeners of this podcast to tell their friends. His research shows that most of those who already tune into his show originally discovered the podcast via word-of-mouth. Thus if he wants to grow the podcast, he needs YOU to tell people. Asking for referrals is a key way to grow your business, but few people get really good with making the right inquiries to enough people. Thom sights the story of a successful real estate agent whose voicemail message is also a plea for referrals. Some might shy away from this type of always seeking introductions, but the most successful business professionals whose companies grow and expand never seem to be shy. 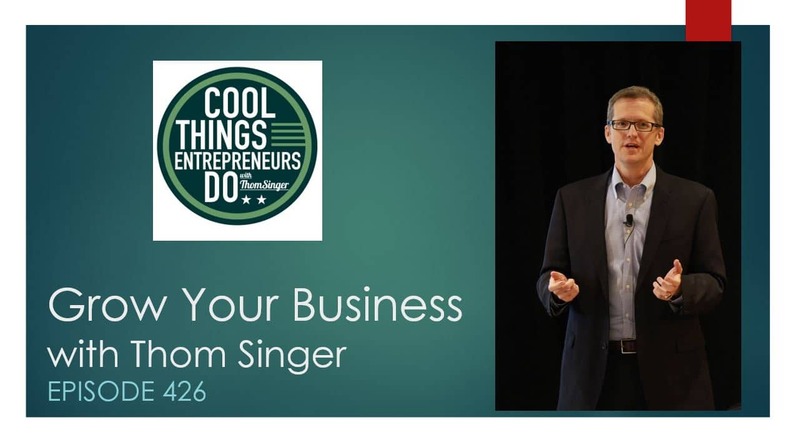 Check out episode 426 of “Cool Things Entrepreneurs Do”.